Upstream investment in crude oil and liquids production is highly sensitive to crude oil prices, particularly production of higher-cost resources from tight rock formations, oil sands, and offshore deepwater. In EIA’s International Energy Outlook 2017 (IEO2017) Reference case, increasing crude oil prices lead to more investment, driving production growth in these higher-cost resources. 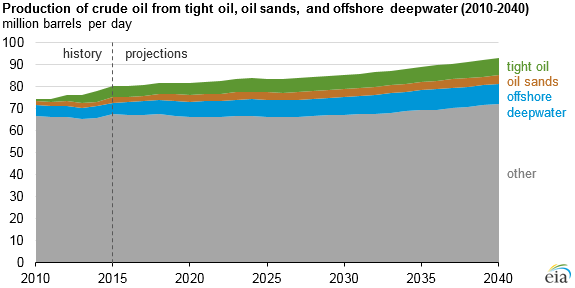 By 2040, EIA projects that the combined production from tight oil, oil sands, and offshore deepwater will reach 21 million barrels per day (b/d) and will account for almost a quarter of the world's total crude oil production. 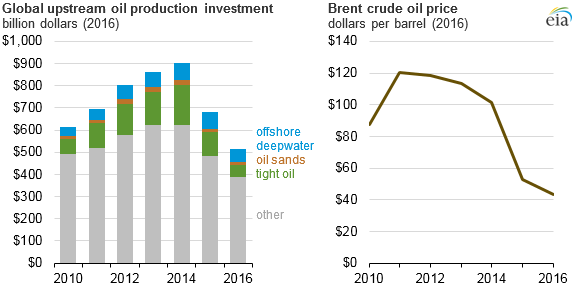 From 2010 to 2014, global investment in tight oil, oil sands, and offshore deepwater development increased from 20% to 30% of total upstream investment. Over that same period, combined production from these resources increased by 4 million b/d, reaching 12.2 million b/d and accounting for 16% of total global crude oil production. Following the decline in crude oil prices in 2014–2015, global upstream investment in these resources decreased from $280 billion in 2014 to $126 billion dollars in 2016. IEO2017 projects that the Brent global benchmark crude oil price will increase throughout the projection period but will remain lower than prices during 2010–2014 in real dollar terms. For this reason, future investment growth in higher-cost resources is expected to be lower than in recent history. The IEO2017 Reference case projects global production of tight oil will increase by 3.3 million b/d, offshore deepwater by 2.7 million b/d, and oil sands by 1.4 million b/d between 2017 and 2040. Total production increases from these sources makes up nearly half of the long-term global liquids supply growth through 2040. EIA expects a large share of global upstream capital investment to be concentrated in tight oil resources in the United States. Tight oil projects in the United States tend to have shorter payback periods because of lower service costs, high operator efficiency, exploitable resources that can be accessed through new technological advances, and a stable regulatory framework. IEO2017 projects that investment in tight oil plays outside of the United States will be lower than investment in plays in the United States through 2025. Development of tight oil can be hindered by a lack of infrastructure and of experience in developing tight oil resources and by competing oil resources that can be produced at a lower cost than tight oil. After 2030, as oil prices continue to increase, more investment in these resources is expected to result in increased production. Total global investment in the development of new offshore deepwater and oil sands projects is projected in the IEO2017 to be limited through 2027. These resources are generally more expensive to develop, take longer to reach full production, and require additional infrastructure, which limits investment in projects other than those already in development. However, higher or lower oil prices would likely affect the allocation and distribution of upstream investments across various resource types and their geographic locations. Additional discussion of factors affecting the development of higher-cost resources is available in an IEO2017 Issues in Focus analysis.